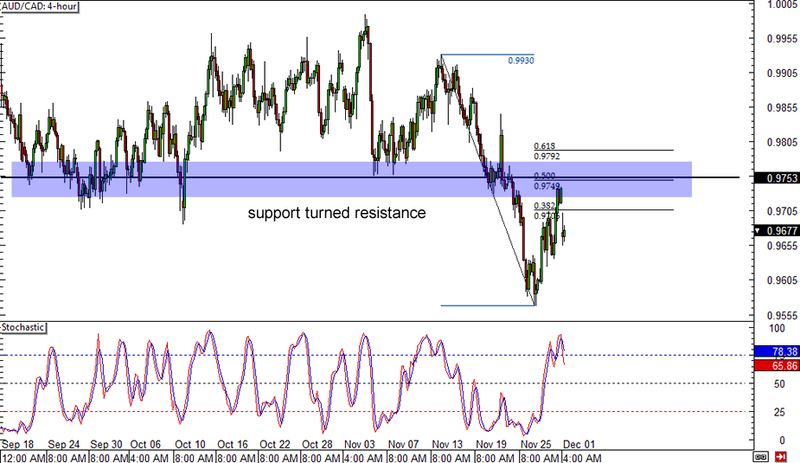 To start off, let’s take a look at this break-and-retest situation on AUD/CAD’s 4-hour forex chart. The pair has previously broken below support around the .9750 minor psychological mark and has dipped close to the .9550 handle. From there, price bounced close to the broken support, which happens to line up with the 50% Fibonacci retracement level. This area might continue to hold as resistance, as stochastic is moving out of the overbought zone and reflecting a return in selling pressure. Price already gapped down over the weekend and showed downside momentum, but it could still fill the gap and retest the resistance at .9750 or the 61.8% Fib near .9800. Reversal alert! 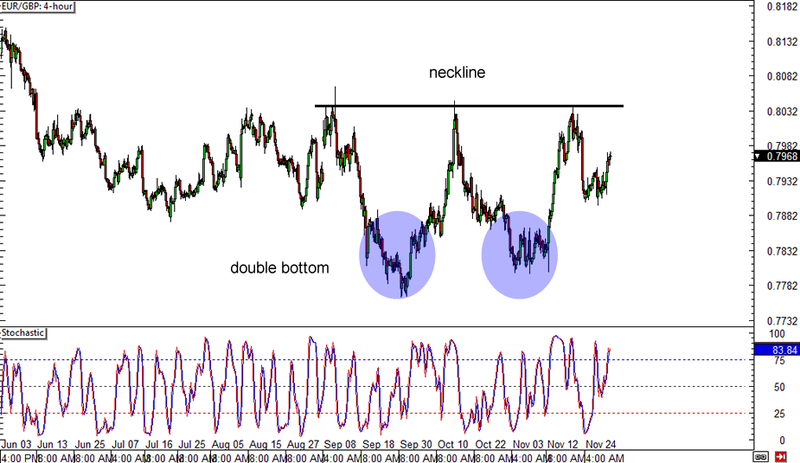 After a failed attempt at breaking past the neckline of the double bottom forex chart pattern on its 4-hour time frame, EUR/GBP looks prime for another test of resistance. If euro bears charge, price could try to break above the .8000 major psychological level once more and confirm the uptrend signal. In that case, EUR/GBP might climb by as much as 200 pips, which is the same height as the chart formation. However, if the .8000 mark still holds like a boss, price could make its way back down and form another bottom near the .7800 major psychological support. 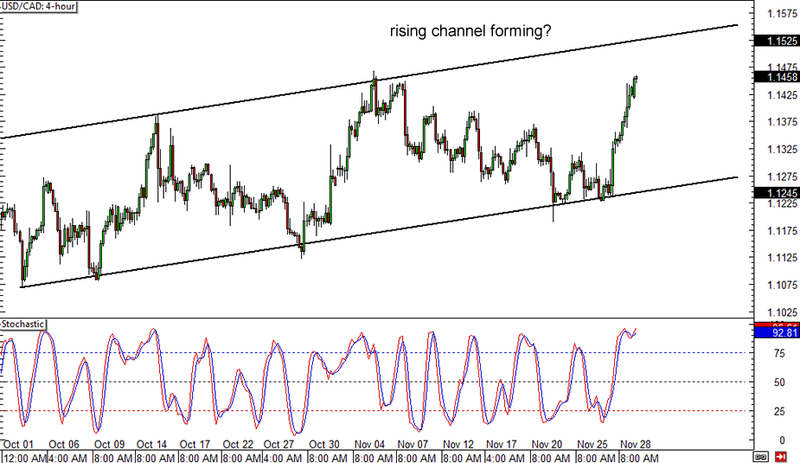 After breaking past the short-term falling channel I showed y’all last week, USD/CAD is now creating a longer-term rising channel on its 4-hour forex chart. Price recently made a strong bounce off support at the 1.1200 major psychological level and is zooming towards the top of the ascending range at the 1.1500 handle. Stochastic is already indicating overbought conditions though, which means that buyers are starting to feel exhausted and that sellers may take over soon. If that happens, USD/CAD could head south and find support at the middle of the channel near the 1.1350 minor psychological mark or at the bottom at the 1.1200 levels.